Posted by Grace Sue on 11/30/2018 10:22:08 AM. When you import MP3 audiobooks into iTunes or iPod, they will be categorized in the Music section, and not audiobook section. Then your MP3 audiobooks may be mixed with other music and not appear in iTunes audiobook section. Now here are two ways for you to Convert MP3 to Audiobook. Then you can remember playback position and adjust your listening speed on audiobook players. You can get MP3 audiobooks on online websites. For Audible adherent, you can use Audible Converter to convert Audible to mp3 audiobooks. Then using iTunes, you can easily make any audio files include MP3 audiobooks displayed in iTunes audiobooks section and acted as audiobooks. Of course, iTunes can remember where the audiobook file last stay. I use iTunes 12.6 to help writing this method. Launch iTunes. Dragging and dropping MP3 audio files into iTunes. Find added audio files in "Music > Recently Added" catalog. Right-click the audio file. Choose "Get Info" option. Click "Options" from the pop-up window. Choose playback options of "Remember playback position" and "Skip when shuffling" under Music media kind. Tip: For multiple file conversions, select all audio files by dragging a rectangle over them with the mouse. Right-click and choose "Get Info" option. Click "Edit Items" option from the pop-up window. Change Media Kind from Music to Audiobook. Click "OK". 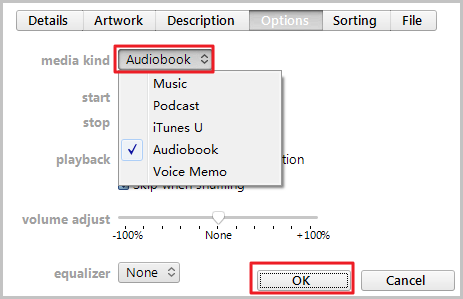 The audio file will disappear in the current Music section and displayed in "Books > Audiobooks" catalog. This method doesn't change the MP3 audio file itself. That is to say, if you delete the audiobook files from the iTunes library after above steps, you must re-follow this method again. Otherwise, the audio files cannot be detected as audiobooks. And for other audiobook players, the above steps are invalid. So, Method 2 is necessary. In this method, you can create audiobook from MP3 files. As a mp3 to audiobook converter, iTunes is great. Even though the created audiobook files are deleted from iTunes library, you can import them from local into iTunes or other players with audiobook features. And there is no need to operate on the original MP3 file again as long as you have stored the created M4B audiobook files. Following are the steps to convert MP3 to iTunes audiobook format. Download iTunes free in Apple official website. iTunes can be used in Windows and Mac OS. And there is no doubt you can easily install it. Open iTunes. Drag and drop MP3 files into iTunes. Choose "Music" section. The imported MP3 files will appear in "Recently Added" catalog. Or click "File" option on the navigation bar. Choose "Add File to Library" or "Add Folder to Library" to import MP3 audio files. The imported files will be displayed in "Recently Added" catalog of the Music section. Click "Edit > Preferences" from the navigation bar. Then click "Import Settings" option from the pop-up "General Preferences" window. Choose "AAC Encoder" from the drop-down box next to "Import Using". And click "OK". Select the imported MP3 files. Click "File > Convert > Create AAC Version" from the navigation bar. Then iTunes will convert the imported MP3 files to AAC version files. After the top conversion progress bar is completed, the generated audiobook file will be displayed below the original files with the same name. The suffix of the generated file is .m4a. Right-click the generated files. 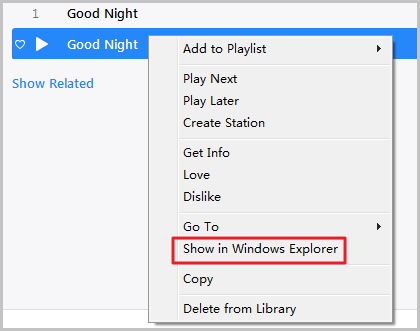 Choose "Show in Windows Explorer" option to find it on your computer. Make a copy of the .m4a file. Then rename the suffix of the copy file from .m4a to .m4b by yourself. Drag and drop the M4B file into iTunes. Then the M4B file will automatically display in "Books > Audiobooks" section. M4B file can be identified as audiobooks. And iTunes can remember playback position of M4B files without any extra procedure. In addition to iTunes, you can also play M4B files with other audiobook players including iPod. If you just want to categorize MP3 audiobooks in iTunes audiobooks section, Check Method 1. If you want to get an audiobook version file of MP3, Check Method 2. With above two methods, you can easily convert MP3 to audiobook files in iTunes. Are they effective for you? Look forward to your comments. If you like it, sharing is great. Grace Sue A reading enthusiast. Always pay close attention to the world of Ebook. Devote myself to share everything about e-book and favorably receive any suggestions. A great tutorial, especially the second part. Thank you Grace. Use opensource project AudioBookConverter@GitHub and encode audiobook with chapters, art-work, tags in few minutes. i recommend to use Avdshare Video Converter to convert mp3 to audiobook. thanks for sharing, but freeware are preferred here first.